Something new today. 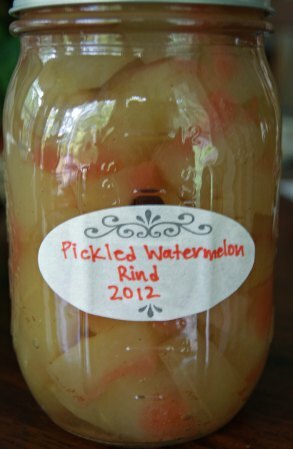 I’ve never had pickled watermelon rind (or even really heard much of it; it seems to be a Southern thing), but I’ve seen recipes for it in no fewer than four different places over the past month, so of course, since we’ve had plenty of watermelon rind floating around this summer, I figured I may as well put some of it to good use. There is some down time, so expect it to take a day or two (mostly soaking). The recipe I used is from The Preservation Kitchen, but they’re all fairly similar to this. 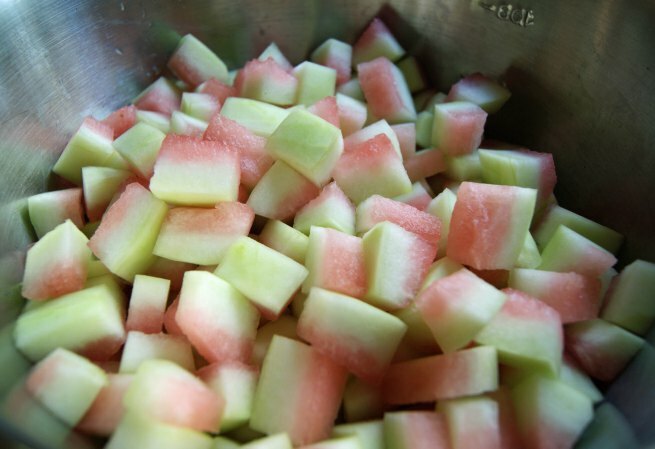 Place the rind into a large bowl. In another bowl, combine the salt and water. Pour this over the rind and let stand for about 4 hours, then drain and rinse. Transfer the rind to a pot and cover with water. Simmer for about 20 minutes or until tender (the rinds will be translucent). Drain and chill. 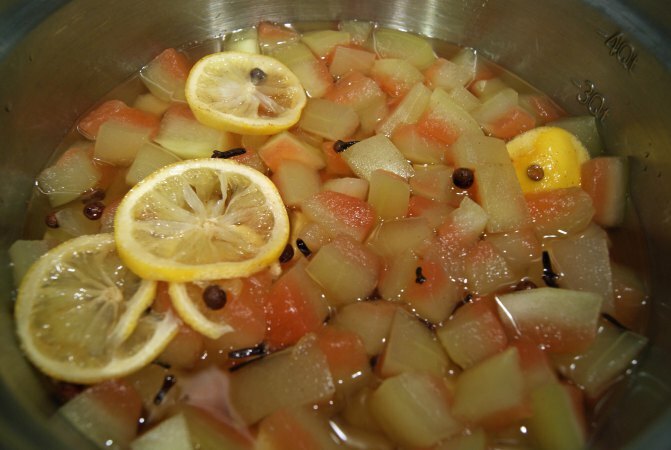 In a saucepan, simmer 1 cup of sugar, the vinegar, and the lemon. In a small saute pan, toast the cinnamon, allspice, and cloves until fragrant (be careful not to burn!). Add the spices to the vinegar and pour over the rind. Cover and refrigerate for a day. The next day, strain the liquid into a pot. Add another cup of sugar and bring to a boil. Pour over the rind, cover, and refrigerate for another day. One more time, strain the liquid into a pot, add the last cup of sugar, and bring to a boil. Divide the rind evenly among three or four pint jars, then pour the liquid over the top of each, leaving 1/2 inch head space. It’s a unique treat – sweet and reminiscent of pumpkin pie, but with a flavor all its own. We’ll see how the flavors develop as it sits. My grandma always made these when I was a kid. She called them watermelon pickles, but the same idea.